”Novosibirsk, or “Novo,” as it is called by some of our American guests (although we don’t use such terminology in Russian), is the acknowledged “Siberian capital” and the third largest city in Russia, after Moscow and St. Petersburg (the current population is about 1,500,000). The only other large cities of Novosibirsk’s caliber in Russia are Ekaterinburg and Nizhny Novgorod. Novosibirsk is indisputably the major city in the Asian part of Russia. There are daily flights from Moscow to Novosibirsk (4 hours long). One can also take the train on the Trans-Siberian railroad (50 hours or more). Obviously, nobody travels such distances by car unless he absolutely has to. Novosibirsk is situated in the very heart of Siberia. In fact, there is a chapel of St. Nickolas in the downtown area of the city, erected in 1913 to commemorate Novosibirsk’s being the “center of Russia". Novosibirsk is situated on Ob River, one of the so-called Great Siberian Rivers. Unknown to many is the fact that the Ob river, and not, for example, the Volga, is the largest river in Russia in terms of length (3360 miles) and water basin square (1857 square miles). Of course, you will not see this huge size in the city itself, because after passing Novosibirsk the river still flows for thousands of miles to the north. Historically, Novosibirsk grew out of a settlement of builders of the Trans-Siberian railroad. Thus it is a young city: having been founded in 1893, it is only slightly over 100 years of age. Nevertheless, the pace of growth has been tremendous. 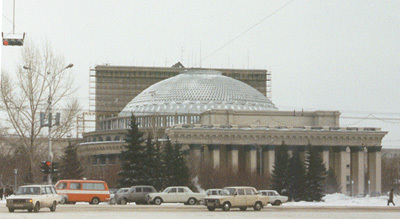 During World War II, much industry was moved to Novosibirsk from the European part of Russia, which either was occupied by the Nazis or was in danger of such occupation. After the war ended, not a small number of these factories, along with their workers, remained in Novosibirsk. At that time Novosibirsk quickly established itself as the Siberian capital. There were several other important reasons for this, such as its being at the crossroads: travels by all means of transportation, whether east-west or north-south, were likely to go through Novosibirsk. Opera and Balley Theatre Novosibirsk is a city of industry, science, education, culture … It is indeed difficult to say what Novosibirsk is not! One of Novosibirsk’s distinguishing features is a place called Akademgorodok, situated 15 miles from the main city – the citadel of Soviet and Russian science. Being technically one of Novosibirsk districts, Akademgorodok is a very special place. It is a community built exclusively for the purpose of scientific research. Six thousand qualified scientists work in 24 research institutes of the Siberian Branch of the Russian Academy of Science. The most prominent are the Institute for Nuclear Physics, the Institute of Hydrodynamics, the Institute of Mathematics, and the Institute of Geology and Geophysics; virtually all areas of science are represented. Novosibirsk State University, together with Tomsk University, is ranked third in Russia, after the Universities of Moscow and St. Petersburg. Many members of the Lutheran parish in Novosibirsk as well as staff workers and students at the seminary are graduates of this institution. It is in the larger Akademgorodok area (closer to the main city) that our seminary is situated. We are in a new settlement of individual cottages, which has a magnificent name: Blagoveschenka (blagaya vest’ in Russian means “Gospel,” and blagovescheniye is “Annunciation”). What an appropriate title for the community where the seminary is located! The seminary is surrounded by other individual buildings, dachas (Russian summer homes), and many Siberian pine-trees—a very beautiful setting indeed! The biggest problem here is the community infrastructure, which is still poorly developed. 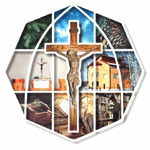 If you plan to visit us, you may contact LTS rector Rev. Alexei Streltsov at e-mail seminary@mail.nsk.ru. We will try to meet you and take you to the right place. If, however, you like adventure and know some Russian, you can go to the Russian version of this site and find out how one can get to the seminary using public transportation.